My daughter's August Bundles of Joy box arrived a bit late this month. The company notified me by email to let me know it'd be shipping a little later than normal, so it was really no big deal. I don't mind getting a box late, as long as I know about it. The box this month was larger than the box we normally receive, so I couldn't wait to see what was inside. 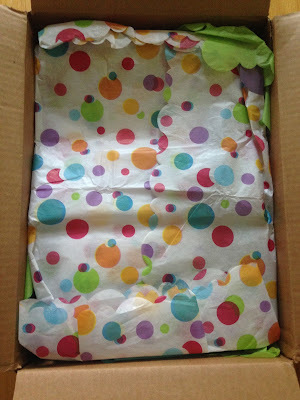 My daughter thought the tissue paper looked like a cake and couldn't wait to see what was inside. She calls everything birthday related "cake" so I think that's what she was referring to. It was very difficult to get pictures without her little hands in them, haha! 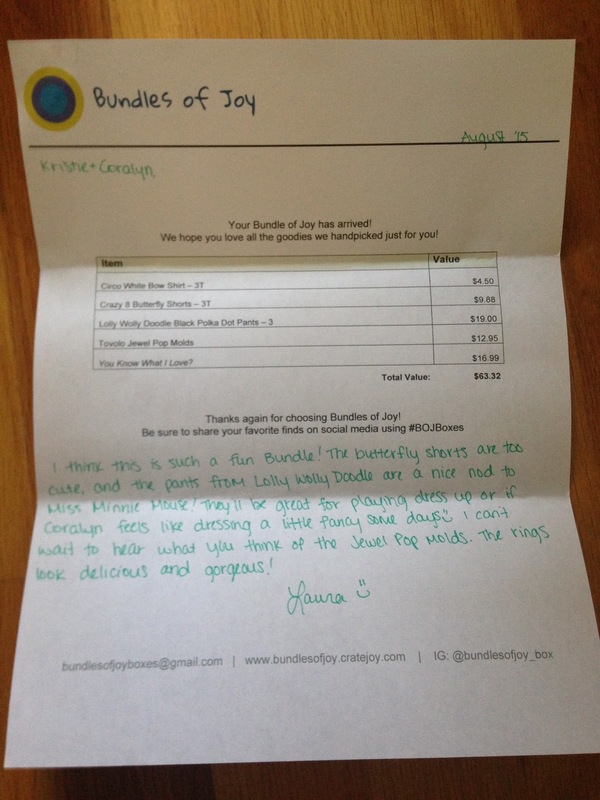 Bundles of Joy always includes a note with everything she chose for us for the month and the retail prices. 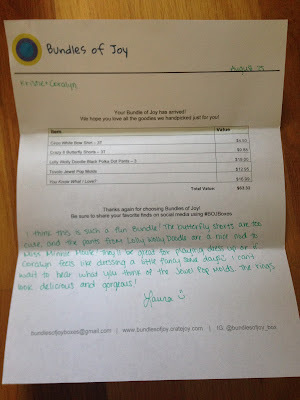 I love the handwritten notes each month, explaining why she chose each of the items. It's such a nice personalized touch. 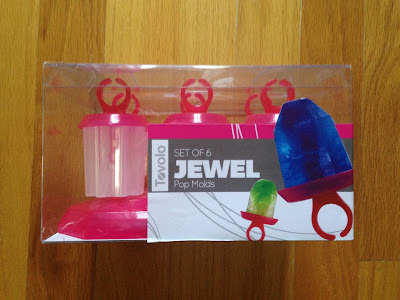 My daughter's favorite item in this box was the Tovolo Jewel Pop Molds. Retail price $12.95. She calls all lollipops and popsicles "ring pops", so this is very fitting for her. She wanted to make them immediately! I love these types of items, because I know exactly what she's eating if I make them myself. And these are totally adorable and like nothing I've ever seen. And you wear them on your fingers while you eat them! She also received a Circo White Bow Shirt. Retail price $4.50. 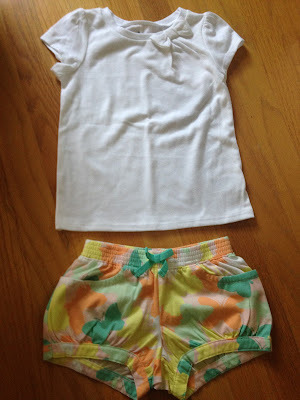 And the shirt goes perfectly with the Crazy 8 Butterfly Shorts we received. Retail price $9.88. This is a perfect outfit for the final days of summer! These shorts will go great with lots of colored t-shirts. And I love getting white shirts, because they look great with everything, but don't last very long. These are both completely my daughter's style. She loves anything comfy that she can play in! 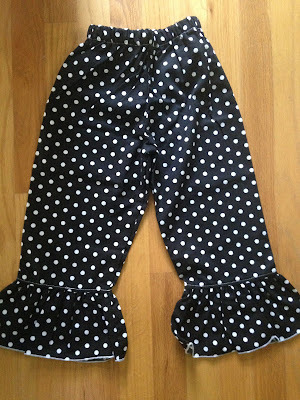 The Lolly Wolly Doodle Black Polka Dot Pants are so cute! Retail price $19. My daughter loves Minnie Mouse and this reminded Bundles of Joy of Minnie, so that's why we were sent these. 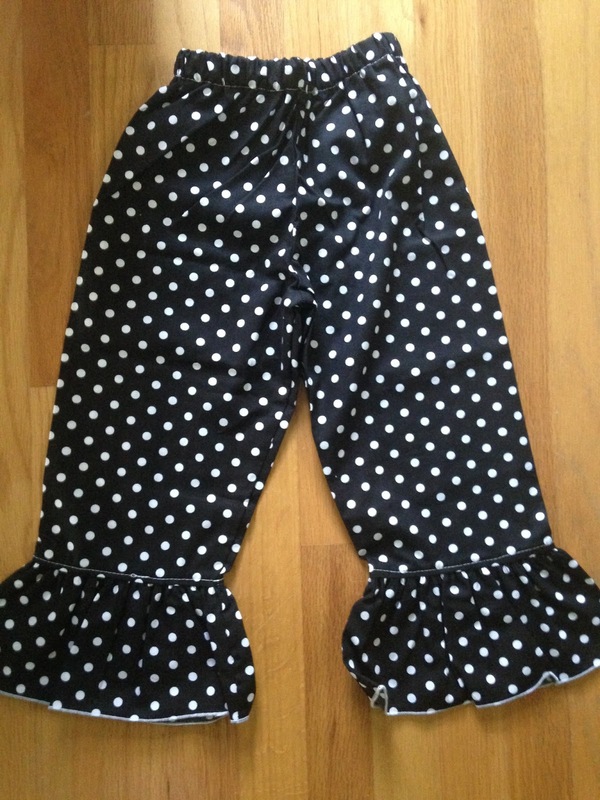 We received a cute Minnie Mouse headband in a previous box that will look perfect with these pants. These are not something I would normally buy, and I really like receiving different things. My daughter hasn't tried to wear these yet, because they're still a little big on her, but I'm sure she'll be wearing them soon enough. The final item she received was "You Know What I Love?" Retail price $16.99. We love books! I had to read this to her right away, and then before bed again. 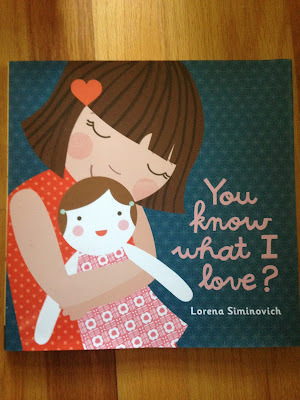 This was a simple read and I think my daughter likes those best. Then she usually tries to recite the words, while "reading" by herself. She loves her dolls, so this was another perfect item for my daughter! The August Bundles of Joy was another great box! I'm always completely satisfied with everything included in these boxes. I can't wait to see what September brings. I'm hoping for a back to school theme, even if my daughter is a bit young for school. Something about Fall and the start of a new school year seems so refreshing every year.